$100 non-refundable booking deposit is due to secure your session. The remainder is due 1 week prior to the session. If the remainder is not paid, your slot will open up and become available again. Time slots will be in 30 minute increments. When booking your session please send me your top 3 time options. These will book first come, first serve style. These will take place in the river bed area. The water is a little warmer and more shallow. It will be better for the children, as well as less crowded. I will have a couple of chairs, a treasure box, pearls, glitter, and of course a DINGLEHOPPER, like Ariel had in The Little Mermaid. Sessions will be 30 minutes long. You will receive the best, edited images on a high res disc with printing rights. I will include as many images as we can get. You will also receive 5 of my hand-selected favorite images in 5 x 7 prints. The entire outfit: head piece, bikini top, and mermaid skirt will be custom made just for YOU and you will get to keep your outfit! You will need to send me your the measurements and the color options of your choice (see below). The designer will begin working on the outfit once your deposit is paid and your session is booked. I highly recommend the age to be 3 years and up. 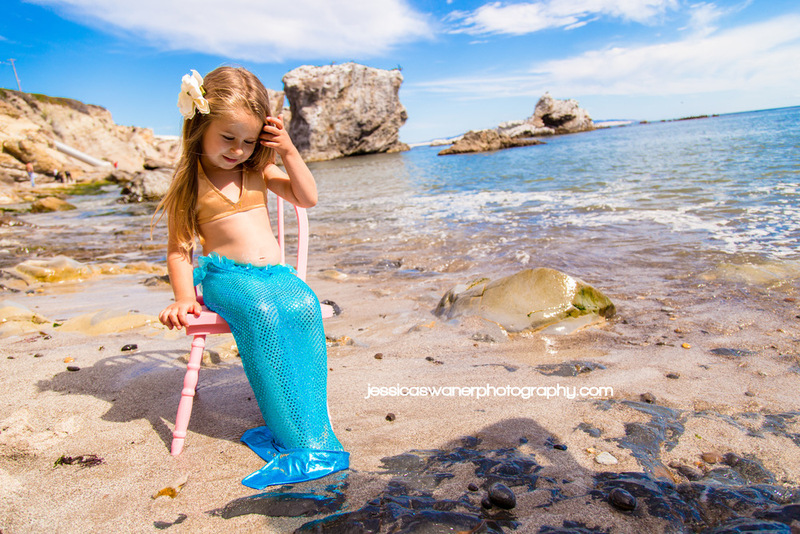 I will not make any age requirements, so if you have a one or 2 year old or a teenager that wants to be a mermaid for a day, I will be more than happy to do a session for them. The only reason I recommend age 3+ is because you will more than likely get wet and a little dirty. The tail is closed at the feet so you cannot run in the outfit. If you would like the tail to be open-ended, please let me know when booking your session. (Please send the following measurements): Bust size, waist, hips, around the thighs, around the knees, around the ankles, and waist to Feet. INCLUDE YOUR CHILD'S NAME, AGE, MEASUREMENTS, OUTFIT COLOR CHOICES, AND YOUR PREFERRED DATE/TIME.